A barge called Riasc on Dublin's 200-year-old Grand Canal is the setting for this novel floating restaurant just five minutes from St Stephen's Green. Lunch and dinner come with the option of a cruise and the choice of eating alfresco in deck or in the plush, comfortable cabin complete with red velvet couches, gleaming tables and even a button to call for service. The kitchen serves up a menu of French, European and Irish dishes to please all-comers. Typically, you could begin with Connemara smoked salmon, avocado salsa and caper dressing or Irish black pudding with apples, pancetta and red wine jus. 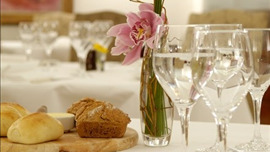 Mains offer anything from beef in Guinness to confit of duck with roasted beetroot and Savoy cabbage champ. Warm pear and almond tartlet is a typical dessert and there are some decent wines and beers to wash it down. With carrots, seasonal mushrooms and baby potato.